February 23, 2011  As talk in Washington turns to a possible government shutdown, members of Congress return home to hear from their constituents. Florida Republican Rep. Daniel Webster, who's holding a meeting in his hometown of Winter Garden, is in an interesting position. He was elected with Tea Party support, but represents a swing district that went for President Obama and was formerly represented by outspoken Democrat Alan Grayson. 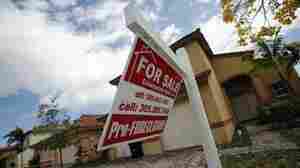 February 18, 2011  Because of tighter financial regulations, things such as subprime lending are unknown in Canada. As a result, Canadian real estate appreciated while property values in Florida, Arizona and other hard-hit U.S. markets went into the tank. Now Canadians are taking advantage of low housing prices in Florida. February 18, 2011  Federal stimulus money is running out and that leaves education in a hole. Florida Gov. Rick Scott says it was wrong for the state to accept the funds in the first place, and he's not going to try to replace them in the budget. That immediately cuts more than $2 billion from schools. February 17, 2011  Florida Governor Rick Scott has rejected $2 billion in federal funding for high-speed rail, dealing a blow to a controversial Obama administration initiative. 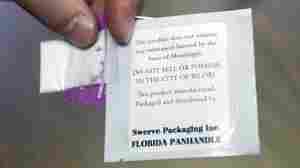 February 8, 2011  The powder, which is being snorted and smoked to produce a cocaine- and meth-like high, has sent dozens of users to emergency rooms after violent behavior and hallucinations. Louisiana has also banned the product. February 7, 2011  Florida's Republican Gov. 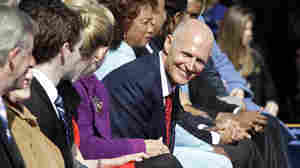 Rick Scott on Monday announced a budget that makes dramatic changes to state government. He's not only cutting a $3 billion budget gap, but also adding what he says will be another $2 billion in tax cuts. He's doing it by making big changes to the state pension system and merging several government agencies. But even some Republican leaders in the state Legislature are dubious. 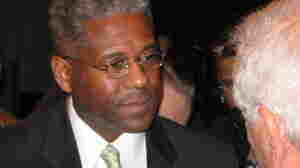 January 28, 2011  Rep. Allen West, a freshman Republican from Florida, held his first town meeting this week. The well-attended event had the feeling of a victory party, though the crowd was largely silent when West called for slashing Medicare, Medicaid and Social Security spending. January 25, 2011  Under new rules recently announced by the Obama administration, schools and religious groups can resume sending travelers to Cuba. Restrictions are also being loosened on nonacademic "person-to-person exchanges." They're small changes but mean a lot to people like Charlie Miranda, who is planning to travel to Havana for a rematch of a 1954 baseball game he played in as a 13-year-old. Abandoned Citrus Groves Produce Problems In Fla.
January 19, 2011  Developers who once bought groves in the hope of turning them into residential areas have abandoned them in the post-housing-boom economy. 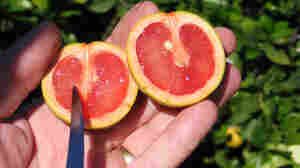 Now, the groves have become breeding grounds for pests and diseases that threaten the rest of the state's citrus crops. January 14, 2011  Photographer Bruce Weber is best-known for his shots of models and celebrities. 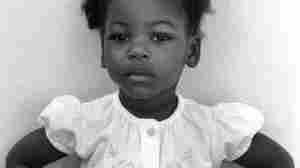 But his recent work is more personal: An exhibition showcases photographs of Haitians in Miami. January 13, 2011  After last year's earthquake, the Obama administration suspended the deportations of Haitians. But as early as next week, the government plans to resume deporting Haitians with criminal records back to their home country. 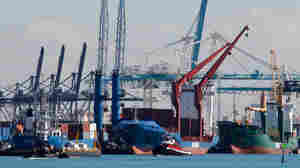 January 9, 2011  Freedom fighter or terrorist? Tomorrow in El Paso, Texas, Luis Posada Carriles goes on trial in federal court on charges related to a 1997 hotel bombing in Havana that killed an Italian tourist. The 82-year old Posada is a staunch anti-Castro militant embraced as a hero by Miami's Cuban exile community. NPR's Greg Allen reports. January 6, 2011  Tea Party favorite Rick Scott ran as an outsider, spending $70 million of his own money. Now he promises to use his experience leading the nation's largest for-profit hospital chain to restart the economy and downsize government. But the state's $3 billion budget deficit presents challenges. January 5, 2011  At Florida International University in Miami, doctors in training are assigned a neighborhood and a family who lives there. 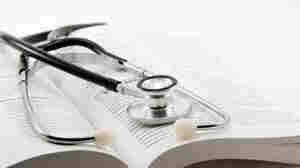 Their mission is to improve the health of the family and the quality of life in the neighborhood. This community-based medicine is helping reshape medical education. December 22, 2010  As GOP leaders in Congress consider whether to ban earmarks, there are some willing to speak up for the practice. In Florida, they include environmentalists concerned about finding money for Everglades restoration and local officials with big projects to fund, such as the dredging of Miami's port.